The Ljubljana Airport – Jože Pučnik, often referred to as Brnik Airport as well, is located 26 km north of Ljubljana centre. The airport yearly handles about 1.5 million passengers, of which the majority in the summer month. 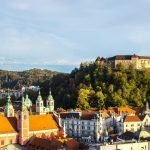 Getting to and from Ljubljana airport to Ljubljana centre is fairly easy; depending on your budget you have various travel options to choose between. Airport bus (public bus from the airport): the cheapest way of travelling between Ljubljana Airport and Ljubljana city is to take the airport buses which depart on whole hour from the airport, on most weekdays there is a bus on the hour from 05:00 till 20:00. The price for a ticket from the Airport to Ljubljana bus station is around 4 Euro. As the bus is a public bus and not an airport shuttle, it makes numerous stops on the way to the bus station and the travel time for the 31 km long route is about 50 minutes. Buses are in general parked outside the main terminal building, you can not avoid seeing them when you exit the terminal. The airport bus has several stops on the route before reaching the Ljubljana main bus station. If some of these stops are more convenient for you to reach your accommodation, you may get off the bus prior to reaching the bus station. NOTE: In case you want a direct bus route, save your time and pre-book your bus from the airport to the center of Ljubljana online. If you wish to continue your journey outside Ljubljana, check the direct routes from Ljubljana airport. Transfer from Airport Ljubljana: if you do not feel like hassling with your suitcases from the bus station to your accommodation in Ljubljana, you have an option to pre-book a door to door transfer to any address in Ljubljana or any other city. a driver will wait for you with a name sign where you enter the terminal from customs area. a transfer company will monitor your flight arrival, so your driver will be there even if your plane is delayed. a transfer from Ljubljana airport to Lake bled costs around 40 Euro for 1-3 person and 60 Euro for up to 8 persons in a van. a shared transfer option to Ljubljana is available starting from 10 Euro; this service will also deliver you at any location in Ljubljana. A downside is that you might have to wait at the airport for other shuttle passengers to arrive. Taxi from Ljubljana airport: taxis are located in front of the arrivals terminal and a taxi ride to the centre of town will cost you from 30 – 35 Euro, depending on where you need to be dropped of. In general, the majority of taxi drivers are fair and reliable, so chances of being scammed, like in Prague for example, are limited. Nevertheless, agreeing on the prices before you start the trip is always recommendable. Renting a car at Ljubljana airport: at the airport you will find offices of all major car rental companies like Sixt, Budget, Avis etc, plus several local car rental companies. As everywhere else, renting a car from the airport is a bit more expensive then renting it from a downtown office. You can see prices for car rentals from Ljubljana airport here. Renting a bus at Ljubljana airport: if you are a large group arriving at the airport, you might consider renting a bus prior to your arrival. Bus rental are offered by several bus companies in the area; vehicles for up to 70 people can be chartered. Q: Is there a direct bus from Ljubljana airport to Lake Bled? Q: Can I catch an intercity bus at the airport if I am for example going to Zagreb or Vienna? A: Yes, there are intercity buses running from the airport. 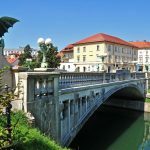 If you wish to travel specificly from Ljubljana to Zagreb, Ljubljana to Vienna, you first have to go to the main bus station and then change buses there, but if you wish to go to some other destination, you can check the possibilities HERE. Q: How much does parking cost at the airport? A: You can see parking prices at Ljubljana airport here. A: Unfortunately there are no hotels directly by the airport. The nearest hotel can be found in the small city Vopovlje which is 3 km from the airport. Is there a bus from the airport to Bohinjska Bistrica ? I travel on 22/2 to Bohinj Park Eco Hotel arriving at the airport at 13:15 pm. There is no direct bus from the airport to Bohinjska Bistrica, but you can take a bus to Kranj and then transfer to the bus line Kranj-Bohinjska Bistrica. Hi, we are 4 adults visiting Ljubljana on Monday 16th April to Saturday 21st April. One of us is in an electric wheelchair. Are you able to transport us to and from the airport? If so please quote me. 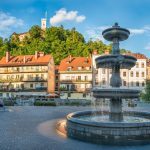 You can book a transfer from Ljubljana Airport to Ljubljana via Transfers by Getbybus. Here’s a direct link (https://goo.gl/oDngg3). You can choose between two minibuses (4-8 people). Hope I helped! Hi, Is there a bus from Ljubljana Airport to Cankarjev dom? If I have to transfer, where can I get to the next bus? There’s a bus from Ljubljana Airport to Cankarjev Dom, but You need to transfer to another bus, and there are two options for that: exit at Main bus station in Ljubljana and take bus nr.18. Or You can exit at Konzorcij stop and take bus nr.6. Wij willen vanaf Ljubliana een shuttlebus naar het vliegveld nemen. Waar vertrekt de bus en hoe duur is een ticket? Taxi from airport to city seems to be exremally expensive. I was charged 65eur. Is it ok? As it was stated in the article, the taxi rate for Ljubljana Airport should’ve been around 30 to 35 Euro if it was official airport taxi. It is always a risk to take a taxi from the airport. To avoid getting scammed, it is advisable to always ask the price of the ride in advance. The airport shuttle runs from Ljubljana Airport to Main bus station. Check the location of Your hotel and see if it’s close to the bus station. Also, I suggest to contact directly the hotel staff, I’m sure they will give You more information about the transportation to Your accommodation. I need to get from the airport Lubljana to Savica, close to the lake bohinj. Please can you indicate the best route and best price for one person. On the following link (https://getbybus.com/en/blog/visiting-lake-bohinj/) You can check how to get from Ljubljana to Lake Bohinj/Bohinjska Bistrica. I am very interested in booking a room in a hotel at Litijska cesta 57, but my plane lands late and I would need to be there before 23.30. What’s the quickest and cheapest option? Unfortunately, the last bus departs from the airport at 21:05 so I would suggest a taxi or a private transfer. Hello is there a bus from the airport to Lake Bled? Thanks! We will arrive from Copenhagen, if we wanna go to Maribor, what is the easest way to go, bus or train and how? There are regular daily departures from Ljubljana Bus and Train Station to Maribor so you can choose either option. Train is a bit faster, you’ll get to Maribor 20-30 minutes earlier than with a bus. Hello, which is the best way to get from the airport to Ljubljana’s train station? And how much does it cost, and how long does it take? The train station is located at the same place as the main bus station so you can just use the bus which goes to the bus station in Ljubljana. The price of the ticket is €4 and the journey takes around 45 minutes. We want to take a bus with our dis-assembled bicycles in a special bike bag from the Ljubljana airport to the central bus station. Will the two of us with our bags be allowed on the bus? Bags with bicycles will probably need to go to the luggage compartment. Other than that, there should be no problems with boarding the bus.